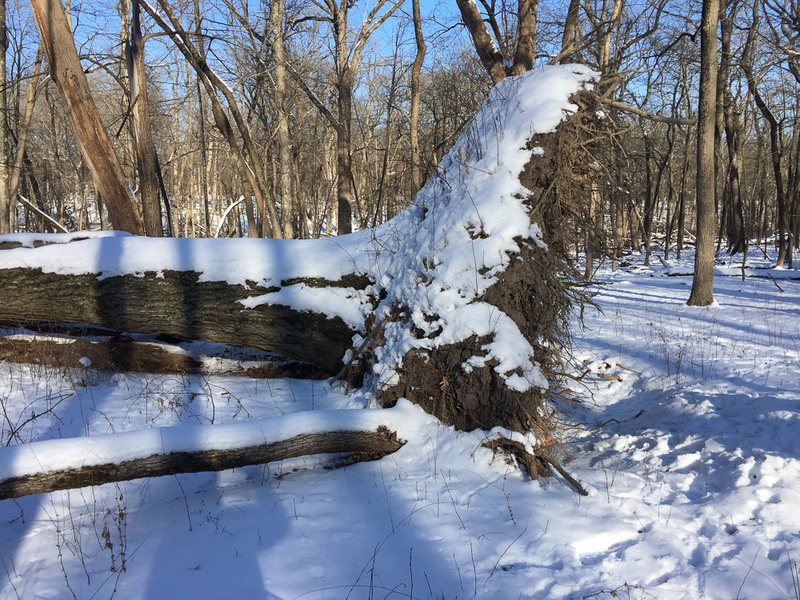 This toppled tree is in the Deer Grove Forest Preserve in Palatine. Deer Grove is one of my favorite places to walk during the winter. When the ground is frozen and covered with snow I can venture off the trails without damaging the plants growing on the forest floor. Ecological restoration projects have been underway here for the last few winters. You can sometimes hear the chainsaws and tree grinding equipment, and smell the smoke from burning piles of invasive buckthorn trees. This forest was probably cut for lumber back in the early 1800’s, and like most forests and woodlands it may have had grazing cows, but the actual terrain is mostly undisturbed, and the forest trees in about 25% of the park are probably pretty similar to what they were 250 years ago. The large trees in the higher and drier parts of this forest preserve are mostly white oaks, along with some hickories and cherries and the occasional red oak. You can see these trees in the pictures here. The extensive ravine topography is quite surprising to someone accustomed to flat urban and suburban land. There are two interesting things in this picture. The first is the question as to what caused this seemingly healthy tree to recently just upend and fall over? I’m guessing this oak was around 75 years old. You can see in the top picture that it was growing at quite an angle to the ground. This lopsidedness probably made it susceptible to blowing over, and that’s probably what happened. The other interesting thing is the roots, and it’s a good illustration of how a tree’s root system is not at all how most of us imagine it. Look at the relatively thin, dense mat of roots in the bottom picture. Many thinner roots are undoubtedly broken off and still in the soil, but it’s clear that most of the roots are in the top 18 to 24 inches of soil. There are not any thick arterial roots or taproots that would have descended down into the soil below. The few thick roots that you can see broken off (and even those aren’t very thick) were growing laterally out from the trunk, close to the soil surface. If you could excavate the remains of those lateral roots in the soil surrounding this tree, you would find them extending quite a ways away from the trunk, far beyond the width of the tree’s canopy, and intertwining with the roots of other forest trees. The lack of large-diameter roots growing laterally from this tree probably contributed to it falling over. The root system is not a below-ground mirror image of the trunk and branches that we might have imagined. The roots of the trees in your yard look more like this than the imaginary mirror image. The roots are growing in the top, thin layer of good soil. If you have a silver maple or honeylocust you are familiar with fairly thick arterial surface roots that make mowing difficult and growing good turf grass futile. There isn’t anything practical that you can do to improve the soil in your trees’ root zone – the root zones are just too large. 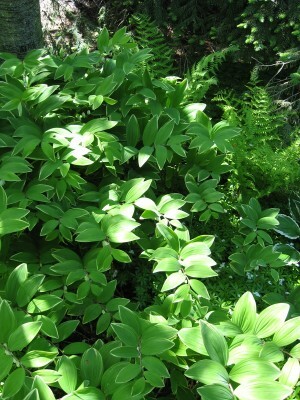 One thing you can do is eliminate the lawn around your trees and plant a layer of small shrubs, sedges, grasses, and herbaceous flowers in its place. The tradeoff here is that you must continually pull the inevitable weeds. You can mulch the planting under the trees, let the mulch decompose, and replenish it every year or so. Mulch will help keep weeds from germinating. It’s not maintenance free, though. Weed seeds that fall on top of the mulch are very happy to germinate and grow right there! You can also plant trees that are adapted to your specific conditions. Unfortunately, the environment where white oaks grow naturally is very different than most suburban settings. But other tree species are well adapted to conditions that occur in suburbia. Swamp white oak, bald cypress, and the popular red-silver maple hybrids all grow well in soils that have a relatively thin layer of good soil on top of clay – which probably describes your yard. Finally, it will be fun to come back to this oak to watch the arrival of fungi, mosses, beetles, and the slow-motion process of decay.